Department of Forest Science, Faculty of Agriculture, Shinshu University, Matsumoto, Japan. Copyright © 2013 Yoshitaka Oishi. This is an open access article distributed under the Creative Commons Attribution License, which permits unrestricted use, distribution, and reproduction in any medium, provided the original work is properly cited. Polycyclic aromatic hydrocarbons (PAHs) are ubiquitous environmental contaminants known to be hazardous to human health. Pine needles and mosses are useful bio-indicators for assessing PAH pollutions; however, the differences in their PAH uptake mechanisms have not been sufficiently discussed. In this study, the properties of pine needles and mosses as bio-indicators of PAHs were investigated on the basis of differences in their PAH profiles. Five sets each of pine needle and moss samples were collected from circular sampling plots and analyzed for 16 PAHs. A comparison of PAH profiles revealed that the proportion of lower molecular weight PAHs (2 - 3 aromatic rings; LMW PAHs) was significantly higher in pine needles (78.5% ± 4.8%) than in mosses (35.4% ± 6.8%). In contrast, the proportion of higher molecular weight PAHs (5 - 6 aromatic rings; HMW PAHs) was lower in pine needles (4.3% ± 2.9%) than in mosses (25.1% ± 3.3%). Further, the combination of PAH isomer ratios showed that PAH sources between pine needles and mosses were not the same. These differences were explained by their uptake mechanisms and partly by the absorption of PAHs from soil particles by mosses. These findings indicate that pine needles are useful for assessing airborne LMW PAH pollution, whereas mosses can be integrated indicators for assessing complex HMW PAH pollution of the atmospheric and soil environments. On the basis of these properties, the usefulness of these bio-indicators should also be evaluated according to the objective of the assessment and the areas where they are applied. Polycyclic aromatic hydrocarbons (PAHs) are a group of ubiquitous environmental contaminants that consist of more than 100 organic compounds with two or more fused aromatic rings. PAHs are emitted into the atmosphere through incomplete combustion due to both anthropogenic and natural sources . Anthropogenic sources of PAH are generally human activities that produce energy, such as vehicular movement, domestic heating, industrial processes, and electric power generation . In urban areas, motor vehicle exhaust is one of the dominant sources of these persistent organic pollutants . Several PAHs are known to be hazardous to human health due to their mutagenic and carcinogenic properties [1,4], and concerns regarding the monitoring and regulation of the quantity of PAHs in ambient air have been increasing. Aerosolized PAHs can be present in either a gaseous or particle-bound phase. These phases are determined by air temperature, the physicochemical characteristics of the compound, and the characteristics of the absorbing surface . In general, 2 - 3-ring PAHs, which have relatively low molecular weight (LMW PAHs), exist primarily in the gas phase of the atmosphere. PAHs with 5 - 6 rings, which have relatively high molecular weight (HMW PAHs), are more likely to be present in the particle-bound phase [1,6]. Furthermore, in 4-ring PAHs at intermediate vapor pressures, a temperature-dependent gas/particle phase partitioning occurs. These phases are closely related to the uptake or absorption of PAHs into plants and soils [7-9]. Vegetation has been used as a bio-indicator to identify point sources of pollutants and to determine regional and global contamination patterns . This approach is based on the concept that the amounts and composition of contaminants in plants provide accumulative and timeintegral estimates of the concentrations of airborne contaminants . In particular, pine needles [3,8,11-15], lichens [16-19], and mosses [7,20-26] are good bio-indicators of airborne contaminants. It is essential to understand the properties of bio-indicators in order to conduct effective bio-monitoring. The mechanisms of PAH uptake have been compared between pine needles and lichens , pine needles and mosses [22,26], and mosses and lichens . In one of these comparisons, Augusto et al. showed that the PAH profile of pine needles (Pinus pinea) and lichen (Parmotrema hypoleucinum) was substantially different from that of the soil, but similar to that of the air. These researchers also reported that the relatively large surface area of lichens made them more efficient at absorbing PAHs than pine needles. In a case study comparison between pine needles and mosses, previous studies [22,42] reported differences in the composition of accumulated PAHs in these two types of vegetation. Further, Migaszewski et al. reported that the PAH concentration and profile of mosses (Hylocomium splendens) were different from those of pine needles (Pinus sylvestris), as were the PAH concentrations and profiles of mosses and lichens (Hypogymnia physodes). These results indicate that mosses tend to preferentially accumulate HMW PAHs to a greater degree than pine needles and lichens. However, this trend requires careful consideration because the plant samples used in these studies were collected from locations that were an unknown distance apart. Therefore, local PAH sources (e.g., vehicle exhaust from nearby paved roads) may have affected the PAH accumulation in these plant types. The mechanisms of PAH uptake that might affect observed differences in PAH accumulation in mosses and other plant groups have not been examined or discussed. However, understanding PAH uptake is important if mosses are to be used as bio-indicators for PAH assessment. Comparison of the mechanisms of PAH uptake by mosses with those of pine needles can be particularly useful, as pine needles are the most commonly used bio-indicators for PAHs. In the present study, differences in the composition of the PAHs accumulated in pine needles and mosses are discussed. Determination of the differences in PAH uptake by pine needles and mosses can provide fundamental understanding that contributes to further extension of bio-monitoring for PAH assessment. Pine needle and moss samples were collected from an area at the center of Kyoto City (34˚59'N, 135˚44'E), capital of Kyoto Prefecture, Japan. Kyoto is an inland city that covers part of the northern half of the Kyoto (Yamashiro) Basin. The mean monthly temperatures range from 8.9˚C in January to 23.9˚C in August and the average annual precipitation is 1545 mm. Five circular sampling plots (diameter: 2 m) were selected in a green space in Kyoto City, where sufficient plant samples were available (Figure 1). These plots were located 300 - 350 m from any main road. Pinus thunbergii Parl. and Hypnum plumaeforme Wilson were selected as the species of pine needle and mosses to sample, respectively. These species are distributed widely throughout urban areas and have previously been used as bio-indicators of airborne trace elements [7,8]. Plant samples were collected from each plot in February 2010. Two-year-old pine needles on trees that were not growing within the crown projection of any other trees were collected from a point 50 - 100 cm above the ground. Figure 1. Location of sampling site and sampling plots. 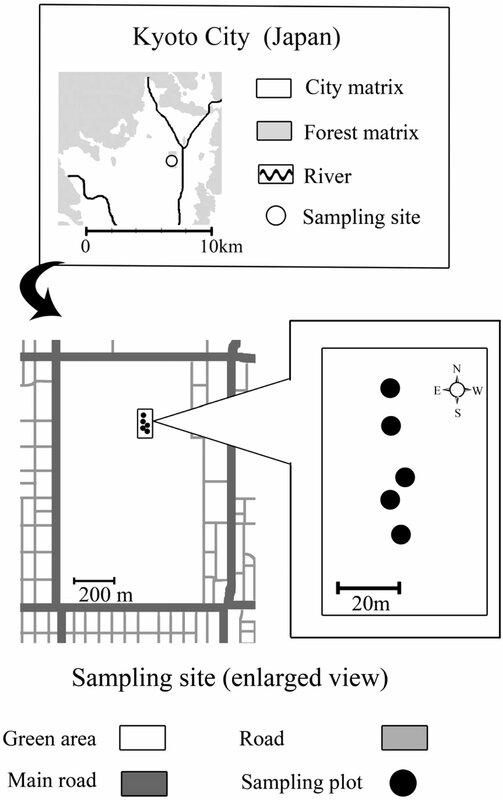 The upper figure indicates the location of the sampling site in Kyoto City and the lower figure contains a magnified view of the site. parts of mosses were not analyzed. The average length of sampled moss tips was 2.67 ± 0.47 cm (mean ± SD), as determined by measurement of 100 samples selected randomly from among all samples. Plant samples were wrapped in aluminum foil, air-dried at ambient temperature, and stored in paper and sealed polyethylene bags in the dark at room temperature until PAH analysis. Homogenized samples [26.9 ± 5.9 g for pine needles and 14.5 ± 3.1 g for moss samples (mean ± SD)] were dried and Soxhlet-extracted in toluene overnight followed by cleaning with alkaline silica gel. Samples were then analyzed using gas chromatography with high-resolution mass spectrometric detection (GC/HRMS). GC/HRMS analyses were performed using a Micromass AutoSpec Ultima HRMS equipped with an Agilent 6890N GC. The GC was fitted with a HP-5 capillary column (i.d. : 30 m × 0.25 mm; film thickness: 0.25 μm). The temperature of the capillary column was 50˚C for 1 min after injection, increased at a rate of 14˚C/min to 220˚C, increased at a rate of 7˚C/min to 300˚C, and held at 300˚C for 40 min. Splitless injection was used to inject 1.0 μl of the final extract into the GC column at an injection temperature of 300˚C. The MS was operated under positive EI conditions (70 eV electron energy), and data were obtained in selected ion monitoring (SIM) mode. The following 16 PAHs were analyzed: naphthalene (NAP), acenaphthene (ACE), acenaphthylene (ACL), anthracene (ANT), fluorene (FLU), phenenthrene (PHE), benz [a] anthracene (BaA), chrysene (CHR), fluoranthene (FLR), pyrene (PYR), benzo [a] pyrene (BaP), benzo [b] fluoranthene (BbF), benzo [k] fluoranthene (BkF), dibenz [a, h] anthracene (DBA), benzo [g, h, i] perylene (BPE), and indeno [1,2,3-cd] pyrene (INP). Deuterated surrogate standards (naphthalene-d8, acenaphthylene-d8, phenanthrened10, benz [a] anthracene-d12, chrysene-d12, fluoranthene-d10, benzo [a] pyrene-d12, benzo [b] fluoranthened12, benzo [g, h, i] perylene-d12, benzo [k] pyrene-d12, indeno [1,2,3-cd] pyrene-d12, and dibenzo [a, h] anthraxcene-d14) were injected prior to each sample extraction for quantification. Quality assurance and quality control were maintained by monitoring on a batch-by-batch basis. A method blank, spiked blank, and surrogates were analyzed between each batch of five samples. The surrogates were pure isotopically-labeled compounds with behaviors that mirror those of the analytes of interest. The average recovery of surrogates was 93% for pine needle samples and 86% for moss samples. The overall quality control for this analysis met the acceptability criteria. All PAH analysis was performed by ERI (Tokyo, Japan) and Maxxam Analytics Inc. (Mississauga, Ontario, Canada). To investigate the differences in the uptake of various PAHs by pine needles and mosses, the 16 analyzed PAHs were classified into three PAH groups based on the number of aromatic rings each contained (2 - 3 rings, 4 rings, and 5 - 6 rings). 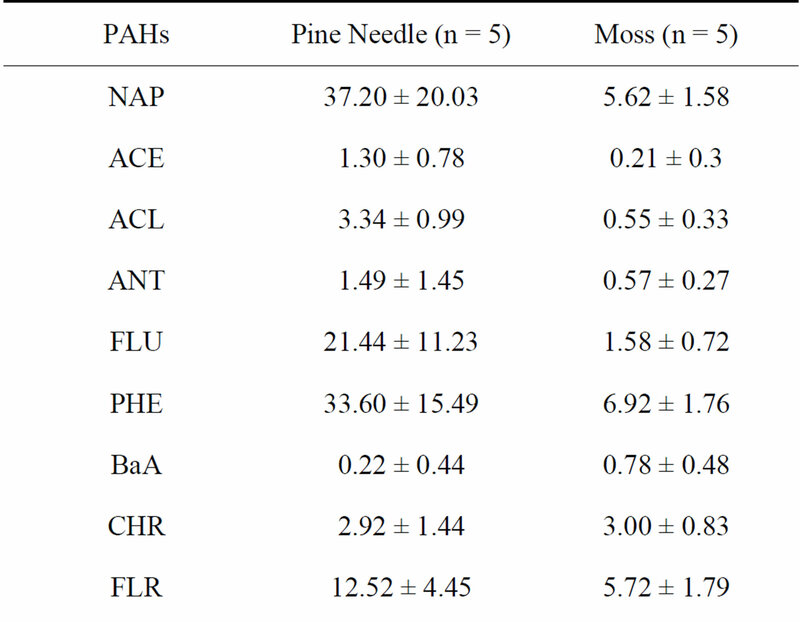 The proportion of the total PAH for pine needles that was in each of these PAH groups was compared to that for mosses using Student’s t-tests. Total PAH in pine needles and mosses was also compared using Student’s t-tests. R software  was used for all statistical tests. Previous studies have shown that PAH sources may be assessed based on the PAH isomer ratios, under the assumption that isomeric PAHs behave similarly and/or undergo similar environmental transformations during transportation from the emitting sources to the final contaminated location [28,29]. However, other studies have suggested that this apportionment is not always valid because isomer ratios change, particularly during atmospheric transport [30,31]. Therefore, in the present study, PAH isomer ratios were used to determine whether the PAHs that accumulated in pine needles and mosses were of the same origin. One of the most frequently used isomer ratios for evaluation of PAH sources is the combination of ANT/(ANT + PHE) and FLU/(FLU + PYR) [29, 32]. Therefore, these isomer ratios were used in the present study. Figure 2. 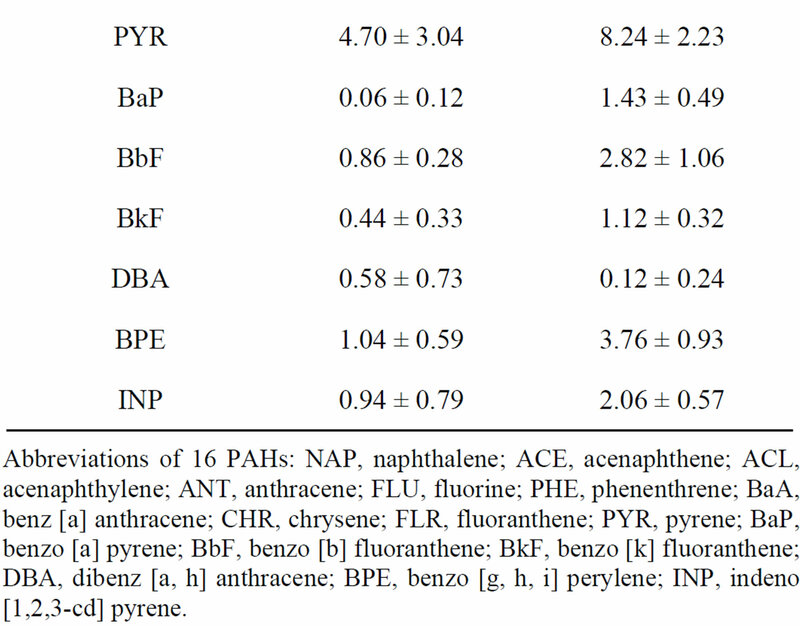 Percentage contribution to total polycyclic aromatic hydrocarbons (PAHs) in pine needles (Pinus thunbergii) and mosses (Hypnum plumaeforme) by individual compounds (Mean ± SD). Bars represent standard deviations. Table 1. PAH concentrations in pine needles (Pinus thunbergii Parl.) and mosses (Hypnum plumaeforme Wilson) (dry weight: ng·g−1; Mean ± SD). Abbreviations of 16 PAHs: NAP, naphthalene; ACE, acenaphthene; ACL, acenaphthylene; ANT, anthracene; FLU, fluorine; PHE, phenenthrene; BaA, benz [a] anthracene; CHR, chrysene; FLR, fluoranthene; PYR, pyrene; BaP, benzo [a] pyrene; BbF, benzo [b] fluoranthene; BkF, benzo [k] fluoranthene; DBA, dibenz [a, h] anthracene; BPE, benzo [g, h, i] perylene; INP, indeno [1,2,3-cd] pyrene. than that in mosses (d.f. = 8, t-value = 3.0 d.f. = 8, p = 0.016). A comparison of the proportion of each PAH group to the total PAH is shown in Figure 3. The proportions of 2 + 3 rings, 4 rings, and 5 + 6 rings were 78.5% ± 4.8%, 17.2% ± 2.6%, and 4.3% ± 2.9% for pine needles and 35.4% ± 6.8%, 39.5% ± 4.5%, and 25.1% ± 3.3% (Mean ± SD) for mosses, respectively. 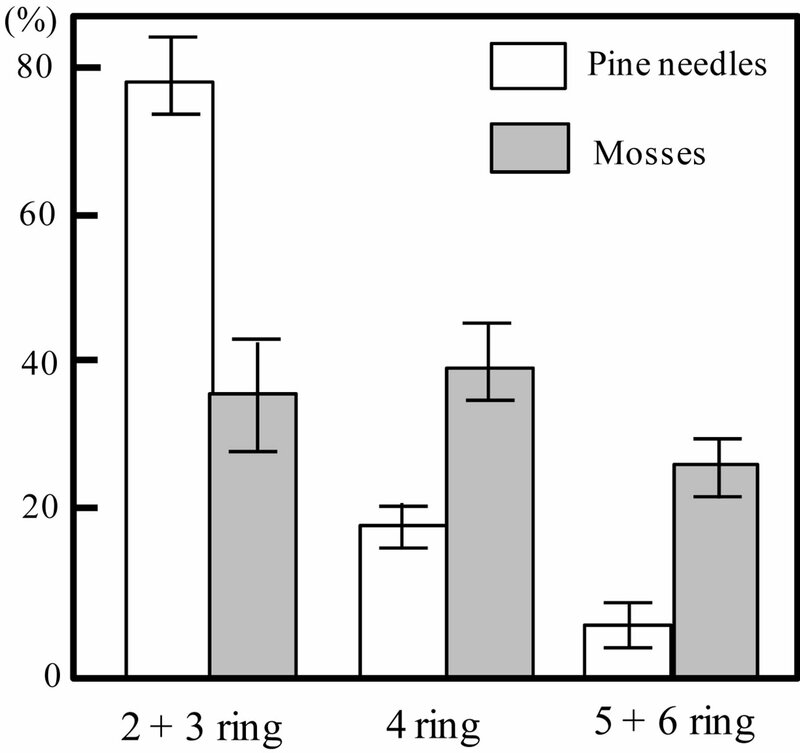 The proportions of 2 + 3 rings were significantly higher in pine needle samples (d.f. = 8, t-value = 10.4, p < 0.01), whereas those of 4 rings and 5 + 6 rings were significant higher in moss samples (d.f. = 8, t-value = −8.6, p < 0.01; d.f. = 8, t-value = −9.5, p < 0.01). These results also indicate that the proportion of each PAH group to the total decreased rapidly as the number of aromatic rings in the pine needles increased. In contrast, mosses exhibited a slightly less clear decreasing trend. 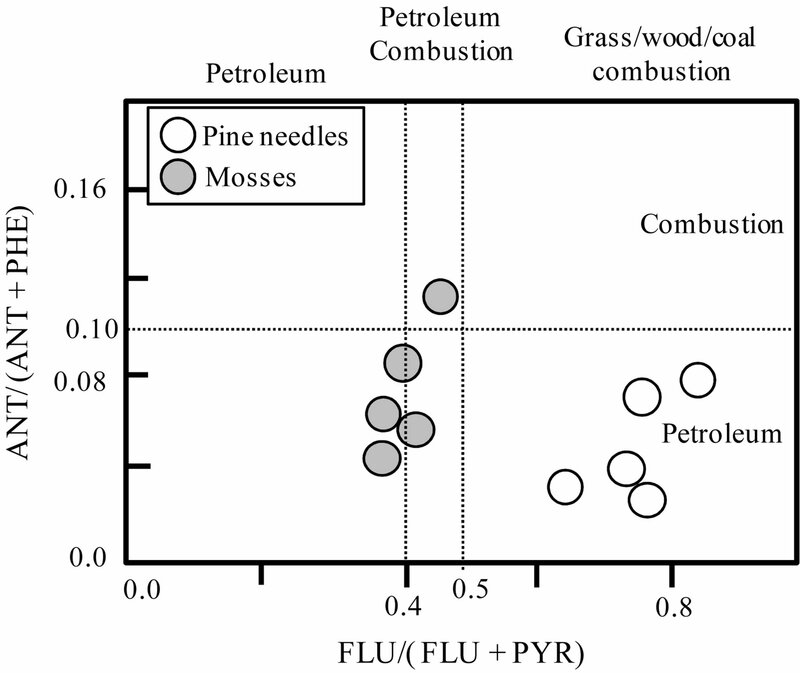 Plots of the ANT/(ANT + PHE) versus the FLU/(FLU + PYR) ratios for pine needle and moss samples are shown in Figure 4. The ANT/(ANT + PHE) ratio for all samples except one were <0.1 (mean ± SD = 0.05 ± 0.02 for pine needles, 0.07 ± 0.02 for mosses). The FLU/(FLU + PYR) ratio for pine needles was around 0.7 (mean ± SD = 0.74 ± 0.06) while it was around 0.40 (mean ± SD = 0.40 ± 0.07) in moss samples. A cross-plot of these isomer ratios clearly distinguished pine needle samples from moss samples. Figure 3. 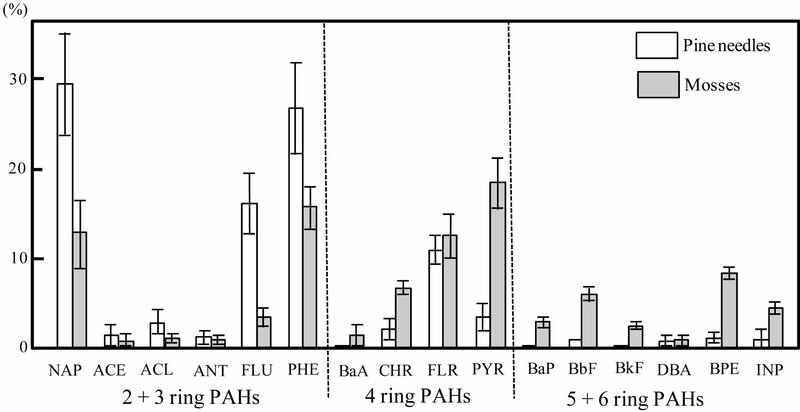 Proportion of total PAH concentration attributable to each of three PAH groups (2 - 3 rings, 4 rings, and 5 - 6 rings) in pine needles (Pinus thunbergii) and mosses (Hypnum plumaeforme) (Mean ± SD). Bars represent standard deviations. Figure 4. Cross-plot for ANT/(ANT + PHE) and FLU/(FLU + PYR) ratios for pine needle and moss samples. Abbreviations: ANT, anthracene; FLU, fluorine; PHE; phenenthrene; PYR, pyrene. in the sources of the PAHs in pine needle and moss samples. The results in this study are in agreement with results of previous studies that reported high concentrations of LMW PAHs in pine needles [9,10] and high concentrations of HMW PAHs in mosses [7,22,26] across different locations. The relatively high concentration of HMW PAHs in mosses can be explained by differences in the leaf structure and PAH uptake mechanism of pine needles and mosses . The leaf properties of bio-indicators (e.g., leaf size, surface morphology, waxy cuticle, and lipid compounds) are important for understanding their PAH profiles [3,33-36]. Piccardo et al. showed that LMW PAHs diffuse and accumulate more readily than HMW PAHs in pine needle tissues either via the stomata or by diffusion through the cuticle, while HMW PAHs remain in the waxy cuticle layer owing to their strong interactions with the constituent of the cuticle layer. Consequently, the HMW PAHs in the cuticle layer of pine needles are affected more easily by external environmental factors (e.g., rain, temperature, ozone, and solar radiation) that may cause them to be lost from the leaves [3,34]. In contrast, HMW PAHs can be absorbed easily by moss tissues because of they interact weakly with the leaf surface of mosses, which lack a waxy cuticle layer. These differences in uptake mechanisms can also result in different patterns of PAH absorption from dry/wet deposition in pine needles and mosses. Mosses effectively absorb dissolved pollutants from precipitation , while pine needles mainly take up gaseous PAHs via their stomata or by diffusion . Therefore, the PAHs that accumulate in mosses can be more strongly affected by PAHs dissolved in precipitation than those in pine needles. The pine needles examined in this study contained a significantly greater total PAH concentration than was contained in mosses. This high PAH content can be explained by the high content of LMW PAHs that were preferentially absorbed in their leaves. As discussed above, the cuticle layers of pine needles prevent particle-bound PAHs from penetrating into leaf cells; while they effectively accumulate LMW PAHs from the air . Considering the contribution of LMW PAHs to the high amount of PAHs in pine needles (Figure 2), they can be more useful bio-indicators for assessing LMW PAHs than mosses. In addition to the differences in the leaf uptake mechanisms, the relatively high concentration of HMW PAHs in mosses can also be partly explained by their uptake of PAHs through soil particles . While this absorption route has not been proven experimentally, Kłos et al. used radioactive markers to show that mosses take up heavy metals from soil particles adhering to them. HMW PAHs exist mainly as particles and can, therefore, be easily absorbed into soil [8, 41]. Mosses are likely to absorb HMW PAHs through soil particles in the same manner as they absorb heavy metals. The ANT/(ANT + PHE) ratios of most samples in the present study fell predominantly in the petrogenic area (<0.1); though the ratio for mosses tended to be higher than that for pine needles. The high FLU/(FLU + PYR) ratios in pine needles (>0.5) indicated that the PAHs in pine needles were released by combustion of coal and biomass. The FLU/(FLU + PYR) ratios in mosses indicated that they were released by petroleum or petroleum combustion. The cross-plots of these PAH ratios indicate that there was a clear separation of the sources of in pine needles and mosses. This difference can reflect the strong influence of wet deposition and soil particles on PAH uptake by mosses. This study shows that mosses preferentially accumulate HMW PAHs, while pine needles effectively take up LMW PAHs. This difference in preferential accumulation can be explained by differences in the mechanisms of PAH uptake and the influence of soil particles. These findings indicate that we can assess PAH pollution from diverse perspectives by using a combination of pine needles and mosses as bio-indicators; pine needles are useful for assessing airborne LMW PAH pollution, whereas mosses can be used to asses complex HMW PAH pollution in atmospheric and soil environments. Previous studies have examined the usefulness of other bio-indicators for PAH assessment. Pine needles are suitable for the evaluation of long-term trends in atmospheric PAHs , while it has been proposed that lichens may be useful for the fingerprinting of multisource atmospheric PAH pollution  and for the assessment of air quality in natural ecosystems . However, the abilities and usefulness of bio-indicators differ on a caseby-case basis. For example, mosses are not suitable for the assessment of LMW PAH pollution or for assessment of PAHs in areas where mosses are scarce. Therefore, in order to propose effective bio-monitoring for PAHs, the usefulness of bio-indicators should be evaluated according to the objectives of PAH assessment and the areas where they are applied on the basis of their ecology. The author thanks Professor Kumiko Okubo for critical comments and suggestions for improving this paper. This research was supported by the Global COE Program, “Global Center for Education and Research on Human Security Engineering for Asian Megacities”, MEXT, Japan. The study design was approved by the appropriate ethics review board. B. Maliszewska-Kordybach, “Sources, Concentrations, Fate and Effects of Polycyclic Aromatic Hydrocarbons (PAHs) in the Environment. Part A: PAHs in Air,” Polish Journal of Environmental Studies, Vol. 8, No. 3, 1999, pp. 131-136. R Development Core Team, “R: A Language and Environment for Statistical Computing,” R Foundation for Statistical Computing, Vienna, 2012. Y. Oishi, “Does Uptake of Polycyclic Aromatic Hydrocarbons (PAHs) Differ between Pine Needles and Mosses?” Journal of Environmental Information Science, Vol. 40, No. 5, 2012, pp. 31-36.